2.Required full time doctors (BDS 8yrs+ experience) for a Dental clinic Chain located at various part of Delhi/ NCR. Interested can inbox me their contact no. & email id. For any query can reach me @ 8800881356. 5. Urgently required BDS (fresher can apply) for a dental clinic at gurgaon sector 46.
capable of handling independently. RCT, crowns, bridges, restorations. 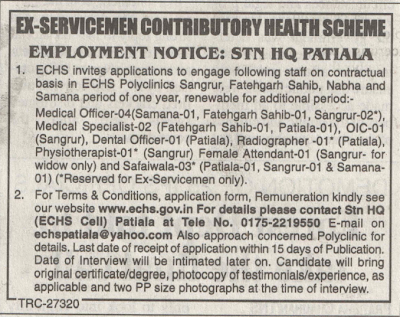 ECHS ( EX- SERVICEMEN CONTRIBUTORY HEALTH SCHEME) invites application for the post of dental officer. QUALIFICATIONS: - i) A Registered Dental Graduate of a Recognized University ii) Should have completed one year compulsory Internship. PAY: The candidates will be paid B/Pay Rs.15, 600+5,400 GP (revised scale) per month with other allowances inclusive of NPA as admissible under rules. Instructions: Interested and Eligible candidates may attend the Written test/Interview to be held on 26.11.2013(08.30 A.M) at Bernard Theatre, First Floor, Institute Block, JIPMER, Puducherry -06 alongwith filled in application in the prescribed format (appended) along with the following certificates in original and an attested copy thereof and a Demand Draft for Rs.500/ for General and OBC candidates and Rs.250/- for SC/ST candidates drawn in favour of Accounts Officer, JIPMER, Puducherry-06. It is proposed to fill up vacancy of 01 (One) Part-Time dental surgeon four hours daily at Central Hospital, SEC Railway, Bilaspur purely on contract basis for a period of one year. 1. Mode of engagement – By “walk-in-Interview” scheduled to be conducted on Friday, 21st of November, 2013 at 11.00 hours at Chief Medical Director’s Chamber, SEC Railway, Bilaspur. 3. Monthly remuneration will be payable in terms of Railway Board’s rates as specified from time to time. Present monthly remuneration payable is Rs.19,400/-. (Rupees Nineteen thousand four hundred only). 4. Educational qualification – Bachelors in Dental surgery with three years of minimum working experience or Post Graduate degree in Dental Surgery from any recognized Medical College/University with registration with Indian Dental Council. 5. Age limit - Upper age limit is 59 years. The PGIMER, Chandigarh invites OFFLINE application from Indian Nationals for recruitment to the post of Senior Residents in the Department of Prosthodontics. A. BASIC DETAILS:- (i) The application form will be available on PGI website www.pgimer.edu.in from 11.11.2013 to 01.12.2013 (23:59 hours). (ii) The last date of deposit of application fee and receipt of the application is 03.12.2013. (iii) Helpline Desks : 0172-2755587 from 0900-1700 hours on all working days. B. Eligibility a) A recognized Dental Qualification included in the Part-I or Part-III of the Schedule to the Dentistry Act.1948 (person possessing qualifications included in Part-1 or specified in the sub-section (1) and (2) or (4) of Section 10 of the Dentist Act.1948). b) Must be registered with Dental Council of India. c) A Postgraduate qualification viz MDS in the specialty concerned.